Here are a few links to articles about how Israelis are working to make their country stronger, or to withstand this onslaught or that, and in general things that demonstrate why Israel is not weakening. The techies are convening. I was at one of these conferences last year, and was tickled to see all the translations into Chinese, and the Indians who got along fine with English. Didn't see may Egyptians, tho, nor even many Europeans. These folks are one of the many reasons why a boycott of Israel, or sanctions against it, won't work. utter disregard of the rights of Israel and the Jewish People. Danny Gordis strikes again: Danny was invited to speak to a J-Street leadership group on their recent trip to Israel. Since he's not a government official, he can meet them without any implications of any sort - so he did. And told them how odd they appear, and how arrogant, and how unfriendly. Looks to me like he washed the floor with them, though I doubt they saw it that way. Here are a number of responses or follow-up comments to the discussion of my post yesterday, about how Israel should leave most of the West Bank, and disengage from the Palestinians. I have no way of knowing what most readers thought of all this, but the ones who commented tended to be critical of the idea. 1. It occurs to me that I didn't say explicitly what should have been obvious. The entire project of leaving the West Bank will require significant legislation on many topics, which cannot be passed by the current coalition (though it could be by a different coalition in the present Knesset). Therefore, the project will need to be sanctioned by the electorate long before it happens. Having closely watched Israeli politics for almost 40 years, since my late teens, I'm convinced such a proposition, formulated correctly, would be a winning platform for any large political party, though Kadima is currently the best positioned to run with it since it was essentially invented for this purpose. But Likud, Lieberman's party or even the almost defunct Labor party could also run with it, and were any of them to do so, they'd probably win the elections. (The formulation would be important). Such a move wouldn't be a putsch by Leftists, it would be the expression of the Israeli will as formulated through the political process. As such, it would be accepted by a majority of the settlers. 2. An early part of the legislation, the proposition to assist settlers to move, has already been under discussion for a number of years; surprisingly - or not at all, depending how much you know about the reality - many settlers themselves are eager to have such a law passed. At the moment, many thousands of non-ideological settler families who moved to acquire cheap housing, cannot move out since their homes cannot be sold at reasonable prices. Were the government to alleviate this in some manner, they would move immediately. This piece of legislation alone would noticeably reduce the number of settlers, it would send a message to our friends abroad that we're serious, and would have no impact at all on the Palestinians' ability to harm Israelis. (On the contrary: there would be fewer Israelis on the West Bank to be harmed). 3. Water, aquifers and so on are not relevant in the mid- or long-term. As I wrote recently, Israel is already on the road to supplying its needs by desalination and purification of used water. This isn't because of the West Bank, it's because we've already exhausted the natural resources. Moreover, Israel supplies water to the Palestinians, not the other way around. 4. The line to be moved back to - I offhand said it would be the line of the security fence - is not the same as the line of 1967, though it isn't very far from it, either. So of course the state of war with the Palestinians would continue, and anyone who loves to damn us for any inch of occupation will be able to continue to do so. I never said otherwise. This is inevitable in any case, since reaching an agreed line of partition with the Palestinians is not possible, as I explained yesterday and many times previously. On the other hand, Barack Obama himself seemed in his recent speech to be suggesting the same thing, or at least something resembling it; so far as I understand the dynamics of international relations, such a move, or even merely its initial steps, would significantly improve Israel's relations with foreign politicians who are not automatically anti-Israel. Such figures would include, at the moment, people like Angela Merkel, Nicholas Sarkozy, Silvio Berlusconi, and as I said, Barack Obama. I don't see how this would be bad for Israel. 5. Canny Israeli leaders should indeed be able to get some political gains from America and even Europe for such a policy. There is no doubt about it. 6. Palestinians and Israelis in the remaining narrow parts of Israeli-occupied West Bank: I don't know what would happen to them. Were Israel to annex the areas, the local Palestinians would be offered Israeli citizenship, and all Israeli laws would apply to anyone living there, Jew or Arab. However, I rather doubt they'd be annexed. There are good reasons why Israel hasn't ever annexed these areas, and they'd still be in place. 7. Gilad Shalit doesn't fit into this discussion. Lots of things don't. It's not a suggestion to correct the world's ills, rather to deal with a specific part of the Israeli-Palestinian conflict. 8. Regarding the objection that I'm advocating fleeing under fire, and that the missiles will rain down on Tel Aviv and Jerusalem (where I live): Guilty as charged, only in the opposite way. Yes, I'm suggesting we leave the West Bank without any expectation of peace with the Palestinians - because such an expectation can't be fulfilled anyway. No, I'm not suggesting that Israel then live with a rain of missiles on Tel Aviv etc etc. I don't regard myself as a fool, nor will the Israeli majority that votes for this project be made up of more fools than any regular electorate. I know all about Gaza (some of you may remember that I had a son fighting there in 2009), and Southern Lebanon, and the mistakes of Oslo, and the Second Intifada, and all those things. I look at all those cases, and see general calm on all fronts, and I deduce that the calm is no coincidence. Hizballah, many West Bank Palestinians, and Hamas in Gaza all hate us as much now as they did previously, and yet over the past few years they've all decided to stop most of their violence against us for the time being. As did the Syrians, Jordanians, and Egyptians before them. At the moment, the weakest link in the chain are the settlers on the West Bank, who are the hardest to protect, just as the settlers in Gaza were effectively impossible to protect before 2005 - a matter never mentioned, somehow, in all the rhetoric about how awful it was that Israel left Gaza. Unlike Hizballah, the Palestinians are susceptible to various types of Israeli pressure. Their economy is essentially dependent on Israel's, while Israel isn't dependent on them. They're dependent on Israel for water, electricity, and indeed their very currency (they use ours, for reasons of their own). The thing is, Israel has never had a policy of full disengagement from its control of the Palestinians, and thus has never been in the position to claim that it owes them nothing. Were there to be such a policy, the entire equation would change. True, Palestinian violence against Israeli civilians would remain part of the equation, but only one part among many. I don't see why Israel's cards in that game would be weaker than the Palestinian hand. Anyway, as I've repeatedly written, the Israeli occupation of Palestine has become the Palestinians' worst weapon against Israel, worse than any military threat they might pose. It's time for Israel to disarm that weapon. That is the base of my position, and all the talk about missiles on Tel Aviv doesn't change it. Back in the 1880s, Yehuda Leib Pinsker thought the Jews could cure the non-Jews of antisemitism by rectifying the abnormality of Jewish existence as a nation without a homeland. He was an important theorist of the first wave of what would later become Zionist settlement. 15 years later Theodore Herzl had the same idea, but given his position as a prominent journalist in Vienna (an important town in those long-past days), and his indefatigable energy, he was able to launch more than a small wave of settlers. Both men were wrong. There's nothing the Jews can do to cure the non-Jews who hate them. Yet their efforts resulted in something vastly better than a cure for Jew hatred. They contributed to the creation of a world in which the Jews can live a full national life, without having to bow scrape and grovel before their enemies. The hatred is still there, but to a certain extent, Jews needn't care any longer. They can get on with life - and they do. Moreover, in spite of the bloody violence directed at the Jews in their homeland, it's nowhere as bad as what Pinsker and Herzl saw, not to mention what came after them, between 1918 and 1945. Remember, in the forgotten pogroms of the early 1920s vastly more Jews were murdered than have been killed in a century of war between the Zionists and their neighbors. Israel is not going to enjoy normality with the Arab world anytime soon, nor will it have peace with the Palestinians. However, this does not preclude living a vibrant and creative national life in Israel. It hasn't so far, and won't henceforth. Nor does it necessarily mean there will be permanent violence. It's probably not a coincidence that after reaching for its nuclear sword in 1973 (according to foreign sources) no Arab army ever again attacked Israel. Instead, the Arabs moved to wars of civilians against civilians, or at least wars of irregulars embedded amongst civilians against Israeli civilians. Yet even those have not proven effective, and once Israel figured out how to beat them, they tapered off. Israel defeated the 2nd Intifada (the first, too), and it frightened both HizbAllah and Hamas, in 2006 and 2009, enough to make them mostly desist from violence. For the time being, of course, until they change their mind, obviously, but nevertheless. In the meantime we get on with all the things we wish to do. Jewish life in the early 21 century is richer, more diverse and more vibrant than at any time since Herod the Great, and even the parts that aren't happening in Israel wouldn't be the same were it not for the return of the Jewish nation to the political realm. None of this success is predicated on settling the West Bank, nor need it be harmed were that settlement to be dismantled (or left outside the border of Israel, which is a far less likely scenario). So why is Israel there? Between 1967 and the beginning of the 1st Intifada 20 years later, Israeli society held a raucous conversation about the importance of settling Jews in the Biblical heartland. (It is significant that the non-Israeli part of the Jewish people didn't have much input one way or the other: Jewish national discussions, it appears, happen essentially in the Jewish national state). The positions and the arguments went back and forth, but by the end of the 1980s the Jews of Israel had decided, as a community, that settling Judea and Samaria was not important enough, and it was abandoned as a national project - if it ever had been one. No matter what might have been the case in, say, 1978 or 1980, for the past 25 years the Israeli consensus has been that someday, in the fullness of time and in the correct international context, Israel will hand over most of the West Bank so as to enable the creation of a Palestinian state. From that moment on, every addition to the settlements, any investments and construction of infrastructures must be regarded as a strategic waste of effort, even if in some cases the creation of better roads, say, or security measures, were essential. For a while the supporters of the settlement project could tell themselves the conversation was not yet over and could yet be tilted back to their position, but not after decades. The reason the Israeli majority never made the effort to halt the settlers was because of considerations relating to the Palestinians. There was the plausible, perhaps even correct assumption that it was the settlements alone which would eventually convince the Palestinians to start negotiating for a two state solution to the conflict, before there was no room left to have Palestine. (The Palestinians made this decision, slowly, impartially, and if they ever really made it, between 1989-1992). There was the assumption that dismantling settlements would be a major negotiation chip for which the Palestinians would play some chip of their own. There was the assumption that the decision to dismantle many settlements was going to be traumatic for Israeli society, and should happen once, in the context of an end-of-conflict peace agreement with the Palestinians, at which point it would enjoy sweeping support and be less painful than in any conceivable other context. Or, as any settler will tell you if you steer the conversation deftly: we've been repeatedly saved by the Palestinians. Since late 2000 and the collapse of the Oslo negotiations at the latest - some would say, it should have been many years earlier - it has become obvious to a very large majority of Israelis that peace with the Palestinians is not to be had. At best, the Palestinians are willing to accept partition only if it's done in a way that leaves open the possibility of an eventual disintegration of Jewish Israel, while the Israelis insist on an end-of-conflict agreement which blocks any conceivable future Palestinian moves or claims. During the 2nd Intifada Israel reconquered sections of the West Bank which had been handed over to the Palestinian Authority, because this was essential to militarily defeating the Palestinians. In 2005 Ariel Sharon began the project of unilateral disengagement from the Palestinians. The strategic idea, never publicly spelled out for obvious reasons but quite explicit nonetheless, was to end the occupation even without agreement with the Palestinians. Perhaps even, some might say, precisely without agreement with the Palestinians, who had demonstrated that their terms for peace would be unacceptable to Israel. The novelty of Sharon's positions in 2004-2005 was the understanding that the occupation itself had become a millstone, a weapon the Palestinians were wielding with tremendous effectiveness against Israel so as force concessions that otherwise would not be offered. If one assumes the Palestinians and Israelis really and profoundly understand each other, an assumption that a century of conflict and cohabitation and enmity and daily collaboration make plausible, the events of 2004-2006 take on a meaning never presented in the Western media. By 2004 both sides knew they weren't moving towards peace. Both recognized how the Israeli occupation of the Palestinians had become the main weapon against Israel. Both knew that the outcome of the unilateral Israeli departure from Gaza would determine the next step. Both knew Sharon's move was a sign of Israeli weariness, though the Palestinian side may have seen it as existential weariness, while the Israelis saw it as tactical weariness with dominating Palestinians. The Palestinian election of Hamas was therefore the result of two considerations. First, that since Israel was wearying, the Palestinian response should be to strengthen their hawkish side. Second, that post-disengagement violence would serve the Palestinian interests, by further weakening Israeli resolve but also by thwarting the next stage of Israeli disengagement, from the West Bank. The Israelis, on the other hand, elected Ehud Olmert in the Spring of 2006 on the explicit platform of continuing the disengagement. The war in Lebanon and the violence from Gaza derailed the unilateral disengagement from the West Bank. Instead, Olmert (and his foreign minister, Zippi Livni) did their best to reach an agreement with the Palestinians, and offered them even more than previous Israeli negotiators ever had, but predictably they were rebuffed. The Palestinians have no interest in an end-of-conflict agreement. Netanyahu, elected in 2009, tried his hand at improving the daily lives of the Palestinians by lifting much of the weight of the occupation, but this has failed: individual Palestinians may benefit, but the leadership, and the people as a nation, need the pressure on Israel to continue until someday it caves in, which is the context for the current policy of having the UN give the Palestinians a state, or - since the UN can't do that, only Israel can - having the UN lay the ground for international sanctions against Israel. These are unlikely to work, for reasons I may write about elsewhere, but the Palestinians see no downside in trying. Which brings us back to the Israeli control of the Palestinians. The attempt to have Greater Israel is long over. The settlements have been dismantled in Gaza, and the electorate has voted to dismantle them in the West Bank. The only reason Israel still controls the West Bank, and still blockades Gaza (ever less efficiently, since Egypt has now opened its border) is because of the Israeli assumption that it must control the Palestinians to fend off their violence. Should Israel leave the West Bank or remove the blockade of Gaza, so the logic, the Palestinians will immediately rain down destruction on Israel, as they did after the departure from Gaza. And well they may. The Palestinians will have the motive and the means, and the international community will shield them from Israel's wrath. But only for a while. Actually, assuming they'll be aiming at Tel Aviv, Jerusalem, and the airport, rather than far-away Sderot, I don't expect the Israelis to hold their wrath very long. For there's a second lesson of the past decade, and that is that in each case where Arab enemies of Israel goaded it, be it Palestinians or Hizballah, the Israelis were eventually goaded and the enemies backed off. In other words, full-blooded Israeli wrath (I use the word blooded advisedly) is not something people enjoy provoking. Moreover, since the Palestinians already provoked it once, in 2002, and watched from close up as others provoked it (2006, 2009), perhaps they might even refrain from trying, at least for a while. My position, to be clear, is that Israel needs to end as much of the occupation as possible, by moving out of the West Bank till the security fence, so as to continue the conflict from a vastly better starting point. Before that, Israel should lift the blockade of Gaza, right now. (This is what Shlomo Avineri says in his column today). This doesn't mean major moves need to be done carelessly. Moving out of the West Bank will take a few years in any scenario, and these could be calibrated: first, stop all construction in settlements, and offer financial encouragement to individuals who wish to move (there will be many thousands of them). Then clarify to the Palestinians that the disengagement may have serious consequences for them, such as severing economic ties, or cutting off supplies of water and electricity, as part of a true end of Israeli engagement - unless the Palestinians wish to negotiate otherwise. Later on, dismantling settlements doesn't have to include pulling back IDF forces, until Israel decides it is safe to do so. Yet the overarching policy should be clear: Israel intends to leave, to let the Palestinians live their own lives, and in return expects the Palestinians to get on with their lives, not attack Israel. Peace will come some other day. But Israel will be a better place, with better international relations. It will still need the most lethal military possible, and it will need to confront many enemies that surround it, but its fundamental situation will be healthier. Most important of all, its internal cohesion and determination will be strengthened. The whole society will know it needs to defend its existence, not an occupation many of us don't want. Update: I've done my best to respond to the many thoughtful comments, here. The other day I was talking to a young scientist from China who's completing her PhD at one of the very best American universities, and has just spent a month in Israel. She hails from what she describes as a "middle-or-smallish-sized Chinese town" of about 8 million people, which I admit I'd never heard of. When I asked for her impressions of her first visit to Israel (pop. 7.76 million) she gushed. First, about the geographic and climatic diversity, then over the human diversity, then over the creative energy. (The first of those three isn't of our doing). The creative energy is constantly seeking new avenues. A couple weeks ago the Economist agreed to stop kvetching over our politics long enough to look at a spot of our economics, and came up with the story of how Israel is trying to corner the international market of water technology. It may or may not work, but if it does it will significantly benefit mankind. To me, the interesting part of the story is how we're trying to repeat a model which proved extremely efficient in the 1990s: the problems that could be solved are there, the eagerness to resolve them are there, then the government steps in with significant funds, but with the intention to jump-start an industry and then get out so as not to interfere with the private innovators and investors and risk-takers. In the 1990s it was the Yozma program which jump-started the high-tech revolution; a few years ago it was a fund for water technology; five years later the government is already moving out and the innovators and entrepreneurs who made it in the 1990s are moving in. I expect it will take another five years or so to know if this is working. During that time many of the water-tech start-ups will fail, for various reasons. If some succeed, however, especially if any of them succeed spectacularly, Israel really could be the Mecca for anyone worldwide who's got dirty water or lack of water and wishes to improve things. Which means most of the world. Well, perhaps not a Mecca. Though the Meccans sure could use it. Also, this success or failure will happen regardless of the settlements on the West Bank, and the blockade or not of Gaza. That's a different universe. That seems to be what the folks in West Dunbartonshire are saying. See for yourselves, and tell me where I'm wrong. Obama believes Israel will have trouble surviving if it keeps holding on to the territories, expanding settlements and suppressing the Palestinians. Ultimately, Israel will find itself facing a Palestinian majority between the Jordan River and the Mediterranean Sea, weapons that can crack its defensive shields and the harsh hatred of the Arab masses. That threatening combination will vanquish the Jewish state. That is hard talk. Obama reiterated this scenario in his two speeches - at the State Department last Thursday and at the American Israel Public Affairs Committee conference this past Sunday. No other U.S. president has expressed more concern for Israel's future. Get out of the territories and you will gain life, Obama is saying. Netanyahu sees this as nonsense; he believes Obama does not understand the Middle East. The prime minister is convinced Israel will be destroyed if it withdraws from the territories. He believes his mission is to face the international pressure and foil the plot to remove the Israel Defense Forces and the settlers from the West Bank and replace them with a Palestinian state. The Arab revolutions have only deepened the dispute between Netanyahu and Obama. The demonstrators in Egypt, Yemen and Syria remind Obama of the American civil rights movement. He believes history is on their side, that the Middle East masses will smash the tyrannies and win political power and civil rights. America will set an example for them and be a beacon of liberty and democracy. To Israeli ears, this vision sounds like an aging hippie's drug-riddled hallucination. Every Israeli cabinet minister, official, expert and intelligence authority who visited Washington in recent months has warned his or her American interlocutors that Iran and the Muslim Brotherhood are lurking behind the demonstrators. Israel is being suffocated by the Islamic octopus, which is closing in on it from all sides. Turkey is already lost. Egypt, Syria and Jordan shortly will become Iranian clones. Netanyahu believes that in the face of this threat the only recourse is entrenchment, and that any concession will bring the whole wall tumbling down. Israel must batten down the hatches and wait for the ugly wave to pass. Both men are partially right and partially wrong, I suspect. Obama is right that holding onto the West Bank is bad for Israel. Netanyahu is right that the Arab revolutions have almost nothing to do with the American Civil Rights Movement, or with the end of Communism in Europe. (Obama yesterday said Poland should be the model for the Arabs; the nicest thing I can say about that is that perhaps he was trying to be real nice to his Polish hosts). They join each other in being wrong, however, when they both assume Israel's existence is in danger because of this decision or that. I've been reading a lot about Jerusalem recently, as an early stage to writing a book of my own on the subject. Since Jerusalem is a very old city, reading its history tends to give a bit of perspective. The world has changed fundamentally 7 or 8 or 9 times since the city first gained any significance beyond its own walls (it existed for about 2,000 years before that, unnoticed). The people living in each of the eras probably regarded their own age as permanent, and they were always wrong, even if sometimes the change didn't come until a few centuries later. So I'm wary of anyone who warns that not heeding him will lead to destruction, but following his advice will lead to permanent stability and peace. Some forces are beyond our ability to bend to our will (or even to foresee); on the other hand, willpower and determination are the only human agents that ensure survival no matter what the surrounding turmoil - which explains why there have been Jews in Jerusalem with very few interruptions no matter how dramatic the upheavals. In my reading, the determination of the Jews to have their own state in this chapter of the human saga, is what will ensure it. Not this specific political decision nor that. Retaining control of the West Bank will not cause Israel's destruction, just as relinquishing control won't; in both cases the determination to persist will be more important, and will enable Israel to deal with whatever threats develop. So let's tone things down a bit. Contra both Obama and Netanyahu, Israel is not about to be overwhelmed one way or the other. Of course, there will still be scenarios less catastrophic than the end of Israel which will play out better or worse, so there's lots of room for idiotic decisions, mistakes which later seem wise, and other internationally acclaimed events which will prove disastrous. Which is why I rather liked the interpretation suggested by David Samuels, writing in Tablet (h/ Michael). The question, then, is whether Obama believes that Jerusalem and the right of return are real issues—the core of the crisis—or not. Having spoken with most of the leading figures in Fatah over the past decade, it is my sense that the real fantasy here is the arrogant assumption that the Palestinian leadership will abandon its most deeply held principles in exchange for what even moderates see as a shriveled slice of historic Palestine. Indeed, reviewing my notes of conversations with all of Arafat’s key political advisers and security chiefs, including Mahmoud Abbas, I can’t identify a single one who expressed any clear willingness to abandon the right of return, or recognize Israel as a Jewish state. At best, these were framed as issues for future negotiations that would need to be submitted to a vote of the entire Palestinian people—including an estimated 4 to 6 million refugees and their descendants. No Palestinian leader I’ve ever spoken with—secular moderates included—imagined Israel as a permanent feature of the political landscape in the Middle East. All saw it as a more or less unnatural creation that would be subsumed, peacefully or not, by the resurgence of Arab Palestine in 20, 50, or 100 years. What Obama has very cleverly done therefore is to appropriate the Israeli proposal to establish a Palestinian state with interim borders—albeit on terms that the Israelis don’t particularly like. Yet each side stands to gain something very real from an interim arrangement that they would be unlikely to gain from an actual peace deal: The Palestinians would receive almost all of the territory they claim for an interim state—except Jerusalem—while holding on to their national dream of one day reclaiming all of Palestine from the Zionists. The Israelis, meanwhile, get a U.S.-sponsored end to the tar-baby of occupation and boatloads of shiny new weapons while holding on to major settlement blocs and an undivided Jerusalem. Hamas doesn’t have to sign a peace deal with the Israelis, and the Israelis don’t have to sign a peace deal with Hamas. America will benefit by having followed through on its promise—made by George W. Bush and repeated by Obama—to establish a Palestinian state. The millstone of Israeli occupation will be removed from around the necks of America and Israel, both of which will presumably find it easier to make friends in the Middle East. This scenario doesn't relate very well to the near certainty that there will be violence from the West Bank directed at Israel, and that Israel will be damned if and when it then responds with violence. Yet the story of the past decade shows that when Israel disregards the international opprobrium and does what it has to do, its neighbors - on the West Bank, in Southern Lebanon, and in Gaza (2002/4, 2006, 2009) do back down, at least for a while; the Syrian example of 1973/4 demonstrates that sometimes getting hit hard enough by Israel can convince Arab enemies to refrain from violence for quite a long time. The idea that ending Israeli control of the lives of most Palestinians might convince them to move along, is not obviously foolish. The way I see it, the structure of the conflict is that the Palestinians reject the Jews right to a nation state, and will not accept peace unless it comes in a form which will enable them to keep striving for the end of Jewish Israel. This is why they've never agreed to anything offered to them. Israel, in the meantime, mostly does accept the Palestinians' right to a nation state, so long as it's permanently limited to the West Bank and Gaza. The Palestinians see a peace treaty as a step on the longer road to Israel's disappearance as the Jewish nation state; the Israelis will allow a Palestinian nation state only if it's the final stage of the conflict. These positions are irreconcilable. What Israel needs to do - and what Obama may indeed be offering - is to break the stalemate by giving the Palestinians less than they could achieve in negotiations, i.e a state without Jerusalem. The assumption since Bill Clinton was president is that someday Israel would agree to divide Jerusalem if the Palestinians agreed to relinquish their demand for return. But they won't, so why should Israel? Better to remove the occupation - by far the most potent weapon the Palestinians have against Israel - and then continue the conflict from a position in which Israel holds all the main cards: It controls Jerusalem, and it prevents a Palestinian return. If the Palestinians can ever think of something to entice Israel to change its positions, good for them, but until then they won't be able to say that Israel must relinquish its most important positions in return for a Palestinian willingness to have sovereignty. They'll have sovereignty already. And they'll be judged - not in the court of world opinion but in the court of real life - by what they do with it. Seen this way, the Egyptian decision to open the border with Gaza yesterday, is good for Israel, not bad. It is another step on the road to separating Israel from the Palestinians, in this case by reducing Israel's ability to intervene in Palestinian lives. If you read carefully, you'll see there are serious voices in Israel who agree on this. Chances are, if you read this blog you're something of a news junkie, with a focus on Israel. In which case you'll most likely have heard all about how Jim Crow is coming to Israel, as demonstrated by the Black Buses on which Haredi men sit up front, and Haredi women are segregated to the back. Of course, the Supreme Court has ruled against the practice, twice - which shows that the problem isn't about to go away, since some sections of the Haredi community feel it's important, and no court can force men and women to sit together if they choose to sit apart. I've got no words of defense for the practice. Nor do I buy into any of the chatter about how it's a reflection of a tradition and needs to be preserved or respected or that sort of thing. It isn't. It's a brand new invention of people who are too engaged in fending off modernity to notice they've gone off the cliff, and it's a sad story about how a fervent minority can dictate to the surrounding majority: so far as I understand it, the innovation comes from the Gur Hassids, and the rest of the Haredi community is being swept along becuase they don't care enough to resist. Still, I was interested to learn, the other day, that in Egypt they've got special compartments in the subway for women only, because women traveling in normal compartments are routinely harassed, and the authorities felt it better to segregate the women than to convince the men to respect them. I don't think I'd heard this before, in spite of all the reports about how great Egypt is about to be. There's been a lot of talk recently about the lines of 1967, most of it not helpful, and some of it vague. Politicians, journalists, pundits, bloggers and most everyone else much prefer generalities to particulars. Here's an attempt to be specific and grounded. The original line was drawn in 1949 during the armistice talks between Israel and Jordan. They mostly reflected the reality of military positions at the end of the war of 1948, but with one major change. The Israelis, fearing that the extreme narrowness of their country would repeatedly entice their neighbors to attack it, demanded that a strip of land along the northwestern edge of the Jordanian-held West Bank be handed over to them, in return for an area to the west of Hebron. The area, known till this day in Israel as The Triangle, contained a series of Arab villages, from Um el-Fachem at its north-east down to Kfar Kassem at the south-west. The Americans demanded that Israel promise not to force any of the villagers out of their homes, and Israel agreed, and today there are hundreds of thousands of their descendents, Israeli citizens all, living in the area. A very detailed map of the region can be found here, put up by the University of Texas, but since it's so detailed it is a bit cumbersome to navigate. It's worth the effort, however. At the time, in 1949, the line, along with the rest of Israel's borders, was explicitly and contractually defined as an armistice line, not as a border, since the Arab states were not willing to officially recognize Israel's existence, and perhaps they wished to have legal grounds for changing the lines later on. For all I know, Israel may have had the same thought. The importance of the matter, however, is that all sides agreed the line was not permanent. This line is variously referred to as the Green Line, the 1949 line, and the 1967 line (meaning June 4th 1967). At its narrowest point, the distance between Kalkilya on the West Bank and Israel's coast north of Kfar Shemaryahu is 8.54 miles, according to the ruler function of Google Earth. Israeli politicians of all stripes like to talk about Israel's narrow waist, even those among them who propose to relinquish control of most of the West Bank. On the other side, Palestinians and their myriad supporters demand that Maale Adumim, a very large settlement east of Jerusalem, must be dismantled, since it cuts the West Bank in two; the distance between the town of Maale Adumim and the Dead Sea is 9.69 miles if you use the definition of the Geneva Initiative folks, and 8.82 miles if you measure from the easternmost structure in the industrial area to the east of town. There is however a significant difference in that Israel has repeatedly indicated that there will be a north-south road under Palestinian control to the west of Maale Adumin, under or over the Jerusalem-Maale Adumim road, so that Palestinians will not need to go all the way around Maale Adumim when traveling from Ramallah to Bethlehem. Actually, quite a bit of its length is already paved. (Pardon my rather clumsy cartographic additions, but you get the idea). My apologies in advance to all friends of Israel for the myth-busting I'm about to engage in, but honesty forces me to it: Nowadays there is no serious Israeli politician who suggests Israel annex the Palestinian town of Kalkilya and its tens of thousands of people; indeed, the security barrier, commonly accepted in Israel as an approximation of the line Israel is comfortable with moving back to, follows the Green Line here. This means that Israel essentially accepts it will return to that narrow waistline of 8.54 miles. This is not to say the entire argument is farcical. It isn't. Israel has serious threats to worry about should it relinquish military control of the West Bank; but that particular, eye-catching slogan, so convenient for sound bites, isn't one of them. An Arab army will attempt to sever Israel at its narrow waist along the coastal plain. Palestinian forces - regular or irregular - will infiltrate along the line, and given the tiny distances they'll be able to reach Israel's main cities within minutes and wreak havoc. Palestinians will be able to shoot directly at numerous targets in Israel's populous heartland. Palestinians will be able to shoot mortars and short-range rockets at numerous targets in Israel's populous heartland. Israel will lose its ability to collect human intelligence about terror cells in the West Bank. Rather than controlling the West Bank, Israel will have to defend itself along a long and twisted border much of it in hilly terrain. Israel will lose most of its control over the aquifer that supplies much of the water to the coastal wells. The Palestinians will have the legal right to demand some of the water of the Jordan Basin. These threats are of varying quality. The first, regarding an Arab army, can be fended off through two measures. First, the Palestinians will not be allowed to have a full-fledged army. If they ask the Europeans, this will be a blessing for them, since armies are extremely expensive things to have, but if they insist having an army is essential to sovereignty they should be reminded that Germany (both of it) was allowed only a limited military between 1945 and 1991, and got along quite well, and Japan's military was also limited post 1945. So no, having an army is not an essential prerequisite for sovereignty. Second, Israel demands a military presence along the Jordan River, to the east of the West Bank. This presence is directed at anyone to the east of Palestine who might be tempted to use it as a launching pad for an invasion of Israel. There is total unanimity among all Israel's security types that this presence is essential, though Netanyahu has recently been hinting it need not require Israeli sovereignty. Perhaps the Jordan Valley will be sovereign Palestinian territory in which Israel has contractual rights to a military presence. I admit I'm personally skeptical. Modern armies being the cumbersome things they are, I don't see how one could arrive on the West Bank suddenly, unannounced, and launch an attack on Israel. Not to mention that no Arab army has tried the full-fronted assault method since 1973, probably for the good reason that it's a harmful exercise. In any scenario Israel will need a powerful and threatening military for the first three or five generations after making peace with all its neighbors, but I don't see why a few thousand troops along the Jordan make much difference. There's a major road down there from Jerusalem, and another can be built from the north, and if there's to be a war IDF forces will be there long before Iraqi or Iranian or Emirati divisions arrive. Water: this is a serious matter, but ever less so. At the moment we're preparing to lay the fifth major pipeline from the coast up to Jerusalem (if I'm not mistaken), which will be unusual in that for the first time it will draw its water not from coastal springs but from desalination stations. There isn't enough natural water in Israel/Palestine for the 12 million people who already live here, and there's not going to be any more, either. Israel already operates major desalination plants, while holding the world record for recycling water; this trend will have to continue no matter what. I don't have the exact numbers at hand, but Israel already supplies some of the water the Palestinians use, and will probably supply more as their numbers grow, no matter who controls them politically. This means water will be a Palestinian weakness, not a threat against Israel. Anyway, the entire subject is one that can be resolved with money, and need not cost human lives. Which leaves us with the various threats of low-level Palestinian violence. These are serious. In 2002-2004 Israel needed to reoccupy the entire West Bank, re-build its intelligence sources and networks, and also construct the security barrier; only then was the bloody 2nd Intifada defeated. Its ongoing control is the reason no kassam rockets or mortars are shot from the West Bank, while many thousands have been shot from Gaza. Moreover, only a fool, or perhaps a Swedish foreign minister, would believe that by signing a peace agreement with some Palestinians, there will remain no Palestinian individuals or groups willing to shoot at Israeli civilians from the shelter of civilians towns and villages; those Swedes and other EU fellows will conspicuously not fly into Ben Gurion airport if they ever remotely fear that their plane could be shot down as it comes in to land at the airport which is within range of Palestinian gunmen with easily portable shoulder missiles. Until someone comes up with a way to assure Israel this danger is not acute, I don't see how it will relinquish military control of some sort over the West Bank. Which is not to say that Israel might not move all its civilians back to a line, say that of the barrier. Which brings us to the matter of the settlers. 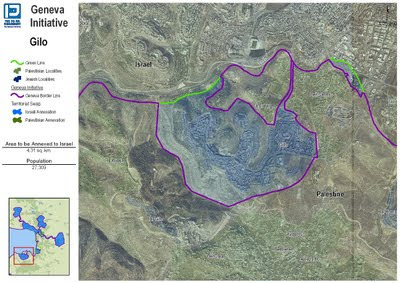 This comes from Le Monde, and refrains from showing that Israel apparently offered some ground inside the Green Line in return for some of the areas it demanded in the West Bank. In any case, since most of the 2nd Intifada happened after the talks at Taba, it clearly didn't happen because Israel was unwilling to dismantle most of its settlements. In case the map isn't clear, everything in either hue of green was to be Palestine. A cursory glance tells us Olmert wasn't trying to create "defensible borders", since the crazy lines reaching up to Kdumim and Ariel, deep into the West Bank, can't really be defended. But we can see how he wanted the line away from the airport (to the west of Jerusalem), and he wished to uproot as few settlers as possible and was willing to pay with territory from within the Green Line. Some of that territory would have made the Gaza Strip noticeably larger, which may have been one reason Abbas never responded: Gaza is Hamas-land, and why would he want them to gain anything? Finally, here's the line proposed by the Israelis and Palestinians from the Geneva Initiative. There are no security considerations here at all, with the possible exception that Israel retains its half of the no-man's land east of the airport. The only consideration is to leave Israeli settlers in their place, if they are within a very few miles of the Green Line; in return, the Palestinians get equal territories from Israel. 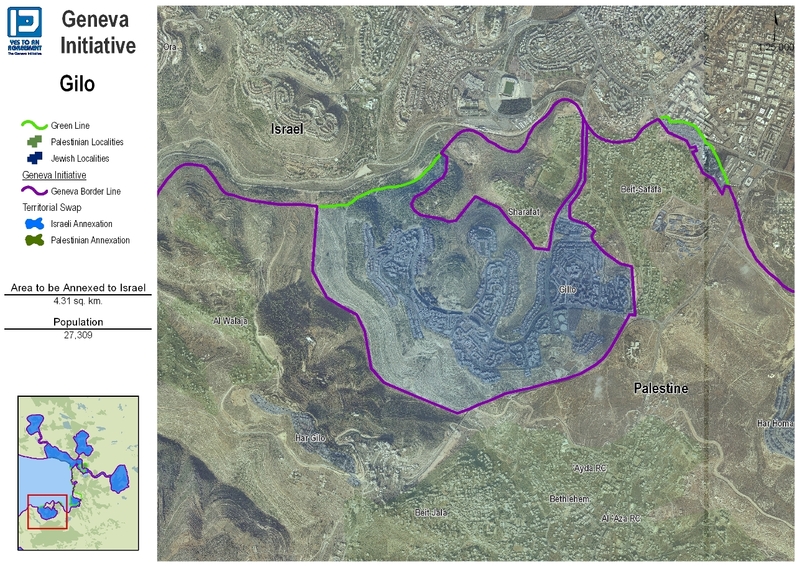 If you compare their map with that of Olmert inch by inch, as I have, there are the obvious differences of Ariel and Kdumim, but there are also less obvious ones such as dismantling Efrat (15,000 people) because it's to the east of Route 60 from Bethlehem to Hebron, dismantling the industrial zone of Maale Adumim, and other things like that. 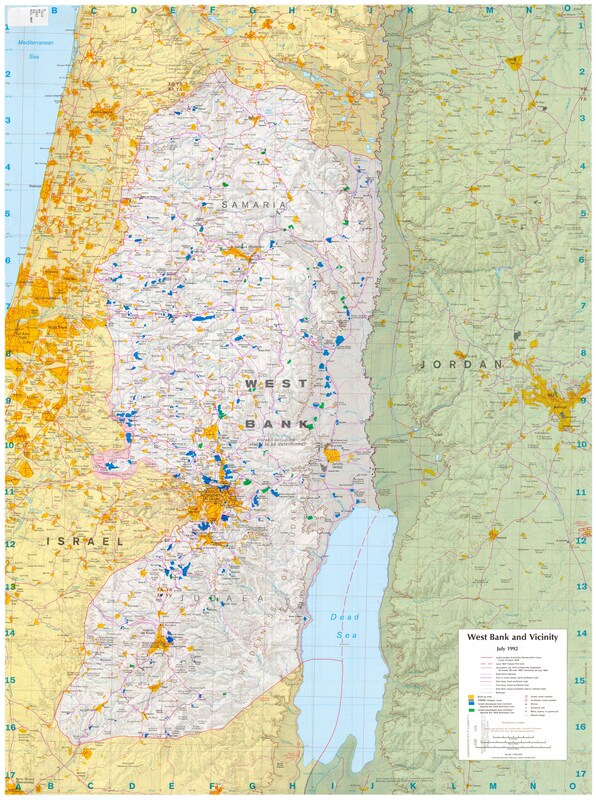 Even in the Geneva Initiative map, however, a majority of Israeli settlers don't move. No matter which map you use, from Taba onwards, the Palestinians get all of the Gaza strip (they've already got it), and just about all of the West Bank, with compensation for what they don't get. I think this demonstrates quite clearly that the inability to reach an agreement isn't about Palestinian sovereignty, which the Israelis have long since agreed to, nor about the size of Palestine. Ariel and Kdumim may still be a noticeable sticking point, but they're not the reason for the lack of a peace treaty. Those would be Jerusalem and the right of return or its corollary, Israel's demand to be recognized as the Jewish State. This has been the case for at least 11 years, if not 45, or 63, or 100. A personal comment: if I had my druthers, I wouldn't have Israel offering empty areas in the foothills west of Hebron or along the Gaza Strip. I would undo the mistake of 1949, when Israel took over the villages of The Triangle, which in the meantime have turned into cities. If the sense of partition is to divide the land along ethnic lines, then that should be what is done. The Palestinians with Israeli citizenship in the Galilee, the Negev, Haifa and Jaffa all live too far from any line to be transferred to Palestine, and they are welcome to remain Israelis. Yet by moving the populace of the Triangle from Israel to Palestine, without ever physically moving any of them a single inch, the Palestinian minority inside Israel will drop significantly from its current 20.5%. Since the Palestinians will not allow there to be any Jews at all in Palestine, this seems a reasonable proposition. The reality, however, is that in the occasional case where Israeli politicians moot this idea (Sharon in 2004, for example, and Lieberman since then) they are always received with howls of protest, and marked as fascists, racists, brutes and evil. The Palestinian Israelis, you see, are eager for their nation to have its own state, but they don't want to live there. They want to live in Israel. Which isn't surprising, if you think about it. Given the choice, who would prefer otherwise? Would you? An anonymous reader suggests this story and recording, about right-wing Amir Benayoun who has recorded a song in Arabic for the Syrian democracy demonstrators, at their request. What can I say? Hee hee sort of sums it up. Eve Garrard, writing on Normblog, says it's time for union members to recognize their passivity equals complicity with the antisemitism of their union's leadership. The trigger of her piece is the attempt by the UCU to redefine antisemitism so that their actions aren't it; by the current definitions, they certainly are. Netanyahu mostly said the right things yesterday in his speech to the American Congress; he mostly said them with the wrong timing; and many of the reports on the speech are unreasonable or uninformed or both. First, an historical fact which is not open to interpretation. Netanyahu broke substantial new ground in his speech. No Israeli prime minster before Ehud Barak spoke openly about Israel recognizing Palestinian sovereignty. Not because they couldn't imagine such a thing, but because it was assumed such Israeli recognition was an important negotiating chip, to be played at the right time. Barak played it at Camp David in July 2000, and in return got praise from President Clinton which no-one remembered half a year later. At the time, however, Barak pretended nothing he had offered was real unless an agreement was reached, as if he could take back what he had offered. So Barak never gave an official speech recognizing Palestine. Nor did Sharon. Olmert may have: it was certainly his position, and since he was prime minster later than Barak, the reluctance to speak openly was gone. Yet Olmert presided over a center-left Israeli government. Netanyahu spoke yesterday about Israel's being the first to recognize a sovereign Palestine, if only the Palestinians reach an agreement with us. He said this in a speech watched by millions, as the head of a right-wing Israeli coalition. We've come a long way from Golda Meir saying "there is no Palestinian nation", and indeed, we've come a long way from the positions of Yitzchak Rabin, remembered worldwide as a brave Israeli leader seeking peace: Rabin never said there'd be a sovereign Palestine, he never intended to move back to the lines of 1967, and he never would have dreamed of dividing Jerusalem. On the first two, Netanyahu, for all his verbal gymnastics, is to Rabin's left. Moreover, the assumption all over Israel's media today is that he enjoys broad support in the Israeli electorate for his positions. His speech broke no new ground concerning the peace process, but it was not expected to. Israeli officials said that Mr. Netanyahu could hardly lay out new proposals to an American audience without telling his own people first. Palestinian officials were dismissive of Mr. Netanyahu’s message, saying it included no new concessions along with the new demands. Netanyahu wasted the generous credit he got from his American hosts to cast accusations at the Palestinians and impose endless obstacles in connection with the core issues. Instead of accepting the principle that the border between Israel and the Palestinian state would be based on the 1967 lines, Netanyahu declared that the Jewish people are not foreign occupiers in Judea and Samaria. He couched his readiness to make far-reaching concessions within endless conditions that have no relation to reality. What are Netanyahu's conditions which are so far from reality, pray tell? First, there's his demand that the Palestinians recognize Israel as the nation state of the Jews, as Palestine will be that of the Palestinians. It seems a perfectly reasonable requirement, unless both sides agree on an end to the conflict and relinquishing of all future demands in an agreement which contains no right of return. Essentially, the two demands are the same thing: if there's no right of return and there is an end of conflict, then the Palestinians indeed don't need to proclaim their recognition of Israel being the Jewish State. So far no Palestinian leader has ever said openly that he will relinquish the demand for a right of return, or even hinted that he might recognize Israel as the Jewish state. Until a democratically elected Palestinian leadership which can deliver on its words does this, there will be no peace. Netanyahu then said Israel would never move back to the lines of 1967. This is also a fact. No Israeli government ever will. The question is what happens to the 5%, give or take, which won't be relinquished, and what will be given in return. This has been the topic of much discussion between negotiators over the past 18 years, and will continue for a while yet. What would Haaretz have expected? That Netanyahu say he'll dismantle Modi'in Illit? Finally, there are Netanyahu's demands that Palestine be demilitarized, a demand any sane (and electable) Israeli leader will always make; and the demand for a military presence along the Jordan River. I'm not enough of a military man to know how extremely essential this really is, especially if Palestine itself is demilitarized; it's aimed against Jordan and Iraq, not the Palestinians. Then there's Jerusalem. Netanyahu says it can't be divided, and of course he's right. Barak and Olmert offered to divide it, but fortunately the Palestinians weren't interested. I certainly hope that Netanyahu's position will be that of all future prime minsters, since the reality of dividing Jerusalem will never bring peace. The summary of all this is that Netanyahu is now staking roughly the same positions his predecessors took, from 2000 onwards, and is well to the left of Rabin and Peres in the 1990s. He - and they - enjoyed a broad consensual support among Israel's voters, now bolstered by a prime minster of the political right. The Israeli electorate is willing - some are eager - to live alongside a sovereign Palestine, but on conditions the Palestinians cannot remotely accept. So there will be no peace anytime soon, as all reasonable observers know, and have known for years. The main thing to regret is that Netanyahu didn't give this speech two years ago. Had he spoken this way when he and Obama were both new in their jobs, the chemistry between them would have been much better, and the positions Obama would have taken would have been different. Look how close they are right now, in spite of all the smoke and mirrors about profound disagreements. Precisely because peace between Israelis and Palestinians is not possible in our generation, it is crucial that Israel's leaders always position themselves as wisely as possible. This means doing everything reasonable to maintain active good will between Israel and the US, and giving Israel's dwindling friends in Europe something to work with. Had yesterday's speech been the official position of Netanyahu's government all along, as it has been the position of most of the electorate, this would have been easier to do. Not long ago I read an article about some Israeli legislation in the 1950s. It was sobering to see that I'd never heard of almost any of the legislators involved in the matter; even the high-ranking cabinet member who had been presiding over the circus was a fellow I'd never come across before, and in the interval have once again forgotten. Fame is fleeting, it seems. This is one of the main drawbacks to blogging, as I've noted before. It's extremely contemporary, which means, it's of the most fleeting importance. No one reads blogposts from two months ago, and why would they? No-one remembers that Bill Clinton and Yitzchak Rabin got off to a cold and stony start, as did Bush II and Sharon, not to mention Reagan and Begin, or Carter and Begin; Bush I contributed significantly to the downfall of Yitzchak Shamir in 2002: Nu, so what? Did it make any real and lasting difference, the kind that anyone will remember in 50 years? (Shamir who? Or, let's see who can arrange the following presidents in correct chronological order: Taft, Roosevelt, Hoover, Wilson, and the other Roosevelt). Barry Meislin has uncovered an article in the Asia Times (of Hong Kong) that takes a very long look. So long, as a matter of fact, that none of us will be alive to test his full thesis, which deals with the year 2100. Yet the demographic trends he discusses will be felt - or not, if he's wrong - well before the end of the century, demographic developments being what they are. Like the vanishing point in a perspective painting, long-term projections help us order our perceptions of what we see in front of us today. Here's one to think about, fresh from the just-released update of the United Nations' population forecasts: At constant fertility, Israel will have more young people by the end of this century than either Turkey or Iran, and more than German, Italy or Spain. With a total fertility rate of three children per woman, Israel's total population will rise to 24 million by the end of the present century. Iran's fertility is around 1.7 and falling, while the fertility for ethnic Turks is only 1.5 (the Kurdish minority has a fertility rate of around 4.5). Not that the size of land armies matters much in an era of high-tech warfare, but if present trends continue, Israel will be able to field the largest land army in the Middle East. That startling data point, though, should alert analysts to a more relevant problem: among the military powers in the Middle East, Israel will be the only one with a viable population structure by the middle of this century. That is why it is in America's interest to keep Israel as an ally. Israel is not only the strongest power in the region; in a generation or two it will be the only power in the region, the last man standing among ruined neighbors. The demographic time bomb in the region is not the Palestinian Arabs on the West Bank, as the Israeli peace party wrongly believed, but rather Israel itself. The right way to read this projection is backwards: Israelis love children and have lots of them because they are happy, optimistic and prosperous. Most of Israel's population increase comes from so-called "secular" Israelis, who have 2.6 children on average, more than any other people in the industrial world. The ultra-Orthodox have seven or eight, bringing total fertility to three children. Europeans, Turks and Iranians, by contrast, have very few children because they are grumpy, alienated and pessimistic. It's not so much the projection of the demographic future cranked out by the United Nations computers that counts, but rather the implicit vision of the future in the minds of today's prospective parents. This, I believe, explains the implacable hostility of Israel's neighbors, as well as the Europeans. It is the unquenchable envy of the dying towards the living. Having failed at Christianity, and afterward failed at neo-pagan nationalism, Europe has reconciled itself to a quiet passage into oblivion. Israel's success is a horrible reminder of European failure; its bumptious nationalism grates against Europe's determination to forget its own ugly embrace of nationalism; and its implicitly religious raison d'etre provokes post-Christian rage. Above all, it offends Europe that Israel brims with life. Some of Europe's great nations may not survive the present century. At constant fertility, Israel will have more citizens than any of the Eastern European countries where large numbers of Jews resided prior to the Holocaust. From there on it gets better. Read the whole thing, if only to raise your spirits. By the time he gets disproved we won't be here to notice anyway. Eli Lake at the Washington Times tells how the relations between the Pentagon and Israel's arm's industry soured between 2000-2005, and then very much got back on track. The crucial turning point was that Israel needed to make up its mind to prefer American needs over Chinese ones. This was clearly the better decision for Israel, though it's good that we had choices to choose from. As China - and India, another burgeoning trade partner of Israel - continue to rise, the alternatives will still be there. Rep. Steven R. Rothman, a New Jersey Democrat who serves on the appropriation subcommittees that fund foreign aid and defense budgets, said during a seminar at the AIPAC conference that the $3 billion in annual military financing for Israel was a sound investment. This story is worth keeping in mind as folks get all roiled over the Obama-Netanyahu spat. Relations between nations are based on interests, and shared values, and other imponderables; they rarely stand or fall because of two particular individuals, especially ephemeral ones such as elected leaders. Here's a longish report on the lefty Israeli NGO Ir Amim, which shows how the organization is successfully inserting its message into the international discussion about Jerusalem. It's in Hebrew, and I'm linking for future reference. Here's a fine speech by Colonel Richard Kemp against the slanderers of Israel, which starts from an unusual point of departure, but then turns to the depressing intensity of the hate regularly spewed at Israel. Then, as if on cue, here's an example he doesn't give: public libraries in Scotland are banning books by Israelis. In a recent discussion I had we were looking at antisemitism in Western civilization. I posited that hatred of the Jews is hardwired into it - this doesn't mean that all westerners are Jew-haters, rather that the potential is there and needs to be fought off. One of the other discussants asked if I was also saying that hatred of Jews is in the DNA of Western civilization, and it occurred to me that the two metaphors are actually instructive. DNA can't be changed, at least in the present stage of technology, so saying that antisemitism is in the DNA of Western civilization would mean there's no hope for change, but also no responsibility to try. DNA is what we're born with, and we can't choose it or control it. Hard wiring, on the other hand, can be changed by the engineers, at the very least, so the moral requirement is there: will people make the effort to re-engineer the wiring, or won't they? Because if they won't, that's their decision. Some people and societies are quite advanced in re-wiring. Lot's of folks, in Scotland and elsewhere, haven't even begun. Haim Watzman has begun writing about his dead son Niot. In Hebrew, the word that means “pastures” (or “oasis” or any green place) is “Niot.” But there’s a small problem. The word is in construct form, a declension that never stands alone. It requires completion. “He’ll complete it himself, in his life,” Ilana says. A century ago Beit Safafa was a village in the hills north of Bethlehem and south of Jerusalem. By the time the British Mandate ended, in 1948, the southern neighborhoods of Jerusalem could be seen on the slopes to the north of the village. When the war of 1948 was over, there was an armistice line running straight through the village, the northern part lying in Israel, the southern part in Jordan. Over the next decade or so, the fields between the village and Jerusalem filled with the neighborhoods of Katamonim, populated mostly by Jewish refugees from Arab countries; eventually the Jewish homes of Pat were erected right next to the Arab homes of northern Beit Safafa. Pat on the right, Beit Safafa on the left. During this period the border was sealed. Family members living a stone's throw apart could shout to each other, but never meet, never break bread together, never share family events. In 1967 the Israelis occupied the West Bank and annexed East Jerusalem. Beit Safafa was united. The villagers were united, too, and over the coming years they multiplied and moved, some crossing the old and forgotten line into the Israeli part, some building larger homes on the hill to the south, which, I remember, used to be mostly empty and now no longer is. Of course, if you know Jerusalem, you'll recognize that the neighborhood on the top of the hill is Gilo, which much of the world calls a settlement since it was populated by Israeli citizens beyond the line of 1949-67. The odd thing is that in all the endless verbiage on the matter, no-one (NO ONE) ever calls the Israeli Arabs from Beit Safafa who moved in the same direction, settlers. Yet it can't be that Jewish Israeli citizens who crossed the Green Line to settle are illegally forbidden settlers, while the Arab Israeli citizens who did the exact same thing are not. That would make international law explicitly racist and antisemitic, and for all its silliness, it isn't those. (If we're splitting logic, by the way, it would be interesting to know how American or Russian or French citizens who moved to the area after 1967 can be regarded as internationally forbidden. Merely because many of them took on Israeli citizenship along the way? And if they didn't? Say some of them retained their original citizenship and never acquired Israeli citizenship: are they also forbidden by international law? There are such people, you know. I recognize this sounds silly, but so does the entire construct if you think about it long enough or observe its details close up). In the decades since 1967 thousands of Israeli Arabs from elsewhere - Nazerath, Jaffa, Sachnin and so on - have moved to Jerusalem. It's a big city, it's got the country's largest university, it's got hospitals, government ministries, and all sorts of other things to encourage migration. Some of them have moved to Beit Hakerem or Rehavia, and that's all right. Others have moved to Beit Hanina, a wealthy area on the city's north side, so they're clearly legally forbidden settlers. Some have moved to Beit Safafa, because it's the one part of town that already had a community of Israeli Arabs and it felt hospitable. Of course, if they moved to the northern part of the neighborhood (it has long since ceased to be a separate village), no problem. If they moved to the southern part however, they're illegal settlers, as we've already seen. The thing is, when you walk through the neighborhood, there's no way of recognizing which it is, unless you happen to be old enough or savvy enough to remember where the long-defunct line ran. Most people aren't. Most people, that is, except for the teeming millions who know that Jerusalem must be divided. So let's get this straight. According to conventional wisdom, the buildings in the forefront of the picture below remain in Israel no mater what, since their denizens are inside the Green line and they're Israeli citizens anyway, except for the ones who aren't. The buildings in the center of the picture must become part of Palestine, since their denizens are outside the Green Line and they're not Israeli citizens, except for the ones who are. Then the buildings on the top of the hill, at the back of the picture, they will remain in Israel since they're part of the Jewish neighborhoods constructed since 1967 which will not be dismantled since there are more than 200,000 people living in them. Of course, the line between the two parts of Beit Safafa doesn't exist on the ground, and in some cases runs through homes constructed since 1967, and the line between Jews and Arabs near the top of the hill runs along garden fences and between parking places on common roads, but hey, don't confuse us with such minutiae. So now we've got the following situation. There are about 16,000 people in Beit Safafa. Some have been Israeli citizens since 1948, but they'll move or stay depending upon where they live now. Some have become Israeli citizens since 1967, but that's immaterial. If they're Arab (they are), and they live south of the Green Line (many do), they obviously yearn to live in a free Palestine, not Israel. No? Some are not Israeli citizens, merely permanent residents, but if they live north of the line, they can stay put, or move to Haifa, or move 25 feet to the south, and thus choose to live in whichever country they prefer. And then of course there are the non-Israeli citizens who moved in 1974, or 1983, or 1992, or 2001, or whenever it was, to Haifa or Kfar Kassem or elsewhere in Israel, and they won't be affected in any case, since they're inside the Green Line and thus impervious to the entire discussion. It's only Jews who are on the wrong side of the line who need to do any explaining or accommodating. In case you're skeptical that anyone would really consider drawing all those lines, here's the map as it appears on the website of the Geneva Initiative. I'm not making up any of this. Post script: My friend Sami (false name), who lives elsewhere in East Jerusalem, tells me many of his neighbors are envious of the Beit Safafians: "They or their cousins have been in Israel since 1948, and they know how to navigate the system in a way the rest of us don't always know." I completed this series of articles about how Jerusalem can't be divided with two posts relating to the question if the city's Palestinians even want to be divided away from Israel. Here I explained why they may actually not want to be divided, and here I showed a little snapshot showing the same. Hamas spokesman Sami Abu Zuhri was quoted by Ma'an news agency as saying that Obama's speech showed the U.S. government will continue "to support the occupation at the expense of the freedom of the Palestinian people. "Moreover, Abu Zuhri emphasized that the U.S. "will fail" in forcing Hamas "to recognize the occupation." Occupation, in the Hamas vocabulary, means anything and everything in what was once British Mandatory Palestine, a fact they never try to hide. Meanwhile, at a meeting of EU bigwigs, the suits competed with one another in their haste to praise Obama and castigate Netanyhu for his obstruction of peace. The Swedish Foreign Minster, for example, thundered that Netanyahu's positions are indefensible, and "the only defense possible is peace". The only solution to poverty, I expect, is money, and the only response to illness is health. I wish I knew how to inculcate such terminal childishness in adults elsewhere. Imagine if we could reduce Hamas folks to the blathering idiocy of "the only conceivable way to live is in peace". Or "Fatah functionaries have our peoples' best interests at heart, and we must work with them to realize our common goals." Or "Christian Palestinians are just like us, and we must embrace them as our brothers." Or "Jews have needs just like we do and the only way to reconcile them is to talk about things until we all accept our differences." Or "women are half of our nation, and only by ensuring they can realize their full potential will we achieve a just society." Labels: Peace Negotiations, Rational Discourse? Crisscrossing Germany by train last week gave me more time than I usually have to read. So I read Doug Merlino's new book, The Hustle: One Team and Ten Lives in Black and White . It's a wonderful book, and I warmly recommend it, even though it has totally nothing to do with the usual topics of this blog - actually, that's an additional reason to read it. The book is presented as the story of a black and white basketball team: a black basketball coach and a wealthy white businessman came together to create a team of 8th-graders half of whom can from wealthy families in white Seattle in the mid 1980s, and the other half came from the black parts of town. They learned to play ball together, they became friends, they eventually even won a championship, and then they got on with life. 20 years later Doug Merlino, one of the white boys, set out to find what had happened to them all and if playing ball together had changed anything, and he found precious little to celebrate. The cultural conditioning on each side was too strong, playing basketball never dented it, the white boys grew into successful white professionals, and the black boys went back to their neighborhoods to be stunted. Sad. This description doesn't do justice to the book, nor to the reality, for that matter. First, because the racial divide isn't so clear-cut. At least one of the white boys has grappled with serious emotional issues and lives on the edge of society, holding his own but far from being a pillar of anyone's community; meanwhile, a number of the black men have climbed out of their childhood circumstances, by dint of the strength of their character, while one or two others, having lived long enough to survive the drug wars and gain perspective on the potential of life, are on the path to offer their children more than their parents offered them. Moreover the description doesn't do justice to the book because it's actually not about a baseball team at all. It's a cultural cross-cut of American society as seen by the men of Doug's generation. He has sections about hi-tech (Seattle!) and drug wars; prep-schools and ghetto schools, churches and welfare policies. He repeatedly talks about the power of movies to depict American society and also inform it. He discusses trends in music.While perched mostly in Seattle, he watches the ebbs and flows of American migration over the past half century. Immigration, too: not all the white boys came over on the Mayflower; some are newcomers finding acceptance. He tells how once black neighborhoods are being gentrified, and how that's playing out, and who's moving where. Even the collapse of the Soviet Union and the Communist bloc make a couple of appearances, once as the backdrop for the murder of one of the boys, once as a place to escape to. America is a gigantic and complicated place, not to be encapsulated in any single short description, but Merlino does an admirable job of depicting its complexity and diversity. Some of the diversity isn't even remotely regrettable: society needs money managers, wine technicians, grade school teachers, attorneys, journalists, janitors and church laypeople. All of them. Most profoundly, however, it isn't a book about a black and white basketball team, because it's a story about universal growth. Doug's voice is what makes this happen. He's got an unusually strong sense of self-deprecation, though without any apologies or cringing. Simply: he wasn't a very good basketball player (neither was Myron, though); he wasn't that good at school, and didn't manage to hold out at the top-notch prep-school (neither did Eric or Damian, though), as a young adult it took him time to find his place (the same went for Maitland, and JT). He set off on the journey that eventually led to writing this book because he missed the old team, and was searching for some sort of closure for Tyler's death. The story begins with a pile of rambunctious pre-teens, then describes a game; after a few hundreds of pages with essentially no group scenes or sport descriptions, it ends with a reunion of thoughtful early mid-aged adults who get together once again and play basketball. When we first met them it was impossible to follow the characters; by the time we leave them, we not only can, we have. Each of them has made his own way through the same moment in history, bolstered or hampered by his own relations to it - which means, its a deeply human story. Final note: English is a rich language. There are more than one way to say things. I was tickled by the extent to which Merlino uses a vocabulary I'm not familiar with, and not only because some of it comes from the black parts of town. He's got capping and peanut galleries, beat-boxing, cutting a line through fog, "I'll hit you" as an invitation to talk, and so on and on. Perhaps it has to do with the fact that, so far as I could tell, the entire cast of the book, heroes supporters and one-line interlopers, doesn't contain one single Jew. Not surprising, of course, given how few of them there really are in America, but quite refreshing for me. Anyway, it's May. Order the book and take it with you to the beach this summer. I was blissfully offline last week, as large groups of notionally "Palestinians" tried to break through Israel's borders with Syria and Lebanon. So a week later I'm adding the obvious comment, whereby the demonstrators were not decrying Israeli settlements on the West Bank. They were demonstrating against the existence of the Jewish State. They were demanding that descendants of people who once lived in British Mandatory Palestine be allowed to move back. Israel could dismantle all settlements, move back to the Green Line, divide Jerusalem, set up an embassy on the Palestinian side of town, and apologize for decades of being not nice to the Palestinians, and these demonstrators wouldn't dream of being satisfied. And all the Western media that didn't explain this, or even condemned Israel for defending itself, are effectively lining up on the side of the Palestinian demand for a right of return. I'm not certain why this needs to be pointed out, but sadly, it probably does. I've collected my various posts on the idiocy of dividing Jerusalem and put them all in one place. I've been telling people about this little project, in which I walk along the putative line of division and see what it looks like. Most people are quite startled: first, by the idea; then, upon reflection, by the fact that it's novel. You'd think there would be thousands of reports like this, that every new journalist coming to town would wish to report on what the line is supposed to look like, and that politicians who are so enamored by the idea would be shoving each other sideways in their haste to be photo-opped on the line. But no. The revolutions and revolts in the Arab world, playing out over just a few months across two continents, have proved so inspirational to so many because they offer a new sense of national identity built on the idea of citizenship. But in the past weeks, the specter of divisions — religion in Egypt, fundamentalism in Tunisia, sect in Syria and Bahrain, clan in Libya — has threatened uprisings that once seemed to promise to resolve questions that have vexed the Arab world since the colonialism era. Actually, the specter of divisions and other bothersome matters were there all the time, of course. So there's nothing happening so far which is particularly surprising, and certainly nothing that couldn't have been foreseen at the height of the popular demonstrations. This isn't to say that the revolutions were always doomed to fail, nor that they're now certain to fail. Rather, anyone with a modest sense of history and human nature should never have been carried away in the first place, has little to be surprised about now, and should hope for a positive outcome. In any case, there's precious little any outsiders can do. Nature is stronger than Man, as these photos demonstrate. The folks who invited me to Hamburg put the entire event on YouTube. The talk at Hamburg wasn't the best of the series - that would have been Weiden or Freiburg - but since the reason to travel was to get the word out, I'm linking. It will be useless, however, for readers who don't know German, which is the language generally spoken in Hamburg. The still photo from the video is ridiculous, I agree. Along the way I met various journalists. The ones in Weiden put a summary of our talk online, tho they quite misunderstood my point about Egypt. Or maybe I wasn't clear. My initial reading of Obama's speech this afternoon is that he is learning. The first two thirds, where he rattled on about the Arab Spring and so on, had all the right words, most of which he forgot to use in Cairo two years ago, and very little substance. The section about Israel and Palestine seemed pretty good to me. On the clearly bright side, he ticked the following boxes: Israel as a Jewish state (twice), Israel's need for security, a demilitarized Palestine, and the silliness of the forthcoming September Spectacle which will do no-one any good. He also seemed to be saying, at least once, that the descendents of the Palestinian refugees will move to Palestine, implying they won't move to Israel. On the dark side, he claimed once again that the present situation is unsustainable. Since it's been sustained, one way or the other, for 44 years, or 63, depending upon how you define it, it's hard to know what he means. Had he said it shouldn't be sustained, that would be different: that would be setting a goal. But can't be sustained? How so? He also castigated the ongoing construction in the settlements, which is disappointing because you'd think the president of the United States would have someone around him to explain that there's almost no construction going on. People who read the NYT can be fooled all the time, but isn't the President supposed to be briefed each morning by an assortment of spooks, analysts other types who get paid to really know what they're talking about? Then there were the gray parts, where different Israelis would have differing interpretations as to whether his speech was positive or negative. He said the partition would be based on the line of 1949-67. Many of us recognize that this may not be historically, legally or morally the case, but practically, it is. Like it or not, that's the line the negotiations have been focusing on for years, and as the man said, there will be adaptation of it, but it does serve as the base of the negotiations. His direct contradiction of Netanyahu's position of let's wait and wait some more, will trouble Netanyahu and his fans, but is actually plausible. We should hurry up, because there's nothing to be gained by waiting. Or is there anything to be gained by being passive while the world around us is active. Most significant of all in my mind was that Obama did not repeat the universally silly line about how peace can be achieved anytime soon. On the contrary, he resoundingly forgot to mention Jerusalem, except to say that it will need to be talked about some other time, as will the Right of Return. In effect, his speech adopted the position of Avigdor Lieberman (and most Israelis) about moving towards a partial resolution of the conflict rather than a final resolution. Update: It occurs to me he also seemed to say the Palestinians have some explaining to do about their new unity government with Hamas. Tick that box, too. He has learned something these past two years. Good for him. I continue to be offline, sorry for the inconvenience. In the meantime, here's an interesting article about a subject I often write about. Noah Pollak takes a long hard look at B'Tselem. Labels: International Law, Israeli Democracy, Rational Discourse? We're approaching 8 million people: ten times the population in 1948, but still one of the world's smaller countries, not that you'd know it from all the noise about us. Yad Vashem generally estimates the number of Jews murdered in the Shoah as close to 5.8 million. The number of Jews in Israel today is 5,837,000. Most of the 322,000 non-Jewish immigrants are culturally Jewish, and their definition has more to do with the politics of religion than with reality. For a demonstration of how committed Israelis are to their national project, I recommend Alex Stein's blogpost yesterday. Alex is decidedly to the left of most of us, but not in a loony way. He's description of Israel and his feelings about it are easily echoed by almost all of us, and the disagreements we'd have with him are much less important than the agreement. I posted my own thoughts on the matter in a concise way on Independence Day three years ago; the words are exactly right today still. Israel's First Century. For whatever reason there seem to be many German readers of this blog. If any of them are interested in introducing themselves, starting Thursday I'll be lecturing in Berlin, Erfurt, Bremen, Hamburg, Weiden (yup) and Freiburg. In Berlin it's the Mideast Freedom Forum Berlin, in most other places the local DIG will have the details. Blogging may well be slow over the next week or so. We're not close friends, Eliezer and I. He's almost a decade older than my father would have been, were he still alive. Born in a small town in Eastern Europe, he was a teenager when his father sent him off to Budapest in the hope things would be better there, which in a way they probably were, since Eliezer survived and the rest of his family didn't. I think about that sometimes: The teenager sent off by his father; the survivor now twice as old as his father ever was. After the war he came to Israel, and in the 1950s started a family, but it wasn't a happy ending. His second son has disabilites, and today, in his early 50s, you can still see this pains Eliezer. His wife, the mother of his three children, died of cancer in about 1970; I remember how her slow death was whispered at school, and can only imagine how horrible it was for her, and for him. Their oldest son, Avi, about whom I've written here and elsewhere, was scarred by his mother's death, to an extent that even we, teenager boys, could recognize. Then in 1982 he was killed in battle, landing Eliezer yet another body blow. He's not a cheerful man, Eliezer, but he's very much alive. At our synagogue he's one of the stalwarts of the conservative branch of the congregation, the ones who are wary of some of the more liberal innovations which sometimes are mooted, yet he's always respectful of the liberalizers who could be his grandchildren, and they treat him with courtesy and accept that some changes can't be done so long as he and his group are still with us. A few years ago he was seriously ill, and it would have been reasonable to suppose he'd reached the tipping point beyond which old men fade away, but no. He lay at home for a few weeks, then determinedly made his way to synagogue with a walker, then a cane, and now he's back to normal; I often see him at the pool. We're not close friends, Eliezer and I, but he knows I preserve Avi's memory, and this has created a bond between us. "Your husband knew my son Avi", he once said to my wife, who responded "I know". "You do? How?" "They were friends, Avi and Yaacov, and Yaacov remembers, and talks about him". It's memorial day, and last week was Yom Hashoah, and tomorrow evening we'll begin celebrating Israel's 63rd Independence Day, and Eliezer is part of all these days. I usually make a point of going over to him after services to shake his hand. His grip is the steeliest handshake I've ever experienced.